I’m going to delve into a bit of Dr. George Hodel’s life, at great risk to having my head explode, as a simple demonstration of why the unsuspecting reader, with no outside knowledge, could never imagine the type of terrible “research” that has been conducted by Steve Hodel. I have always been curious about Steve Hodel’s claim on Page 10 of “Most Evil” (yes, that’s the Zodiac book. Or rather the first Zodiac book). 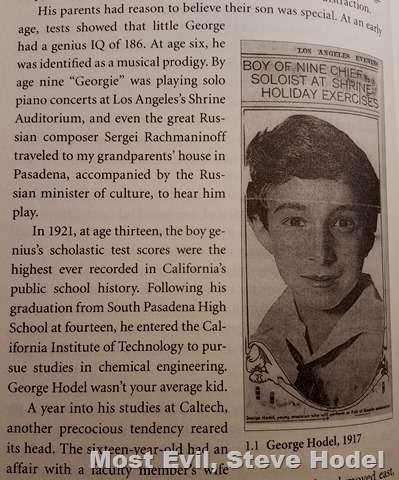 By age nine “Georgie” was playing solo piano concerts at Los Angeles’ Shrine Auditorium and even the great Russian composer Sergei Rachmaninoff traveled to my grandparents’ house in Pasadena, accompanied by the Russian minister of culture, to hear him play. A little boy, 9 years old, has been chosen by the French committee to play before the Belgian mission at the French celebration at Shrine Auditorium today. The lad, thus chosen above scores of adult musicians, is George Hodel, son of Mr. and Mrs. George Hodel of 6440 Walnut Hill Ave. He is a pupil of Vernon Spencer and is regarded in the world of music as a genius. Though a mere youngster, he has studied music for years and he was selected as a piano soloist by the French committee entirely because of his great talent. While he has composed several musical works, he will play Massenet and Chaminade selections when he appears before the Belgian mission. The article goes on to report that the boy genius had written several poems. But notice this one “written a short time before the fall of the Russian czar.” This will be important later. Shrine Auditorium referred to in this story was destroyed by a massive fire in January 1920. The current Shrine Auditorium, with its barn-like acoustics, was built in 1926 and was then considered an architectural triumph and the site of many performances and large public events. Neither one is (or was) suited for a piano recital, so the venue of George Hodel’s “solo piano concerts” is rather suspicious. If we dig deeper, we find that the Belgian War Mission to the United States (America entered World War I in April) was visiting Los Angeles and was welcomed by a parade in downtown Los Angeles and an event at Shrine Auditorium. George Hodel performed exactly once at Shrine Auditorium as part of a much larger event that involved speeches and “other entertainment features.” There was also a banquet at the Hotel Alexandria and Mass at St. Vibiana’s. George Hodel was not playing “solo concerts” (as in multiple performances) at Shrine Auditorium. He was a bit of entertainment between dignitaries’ speeches. But what about Rachmaninoff? Did he meet the boy genius? This entry was posted in 1917, 1947, Another Good Story Ruined, Black Dahlia, Books and Authors, Crime and Courts, Music and tagged 1917, 1947, Another Good Story Ruined, Black Dahlia, George Hodel, Sergei Rachmaninoff, Steve Hodel. Bookmark the permalink. This is fascinating material. Please keep it coming.